If you ever feel yourself losing faith in politics, just remember that not all lawmakers are out to get you. Take Hillary Ronen and Bevan Dufty for example – upon finding out that some public transit stations didn’t have full-time janitors, the two California legislators rolled up their sleeves and got the job done themselves. The dynamic duo have spent every Wednesday morning for the last two months cleaning up several Bay Area Rapid Transit (BART) stops that are notoriously filthy. Ronen, who is a city district supervisor, described the plethora of used needles, trash, and filth at the 16th Street Mission Station as “unacceptable”. Dufty, who is a a former supervisor and current member of the BART board, became inspired to get down in the dirt after receiving a number of complaints from transit passengers about the mess. Because there was not a full-time janitor at the station, the station’s stench had become almost unbearable. 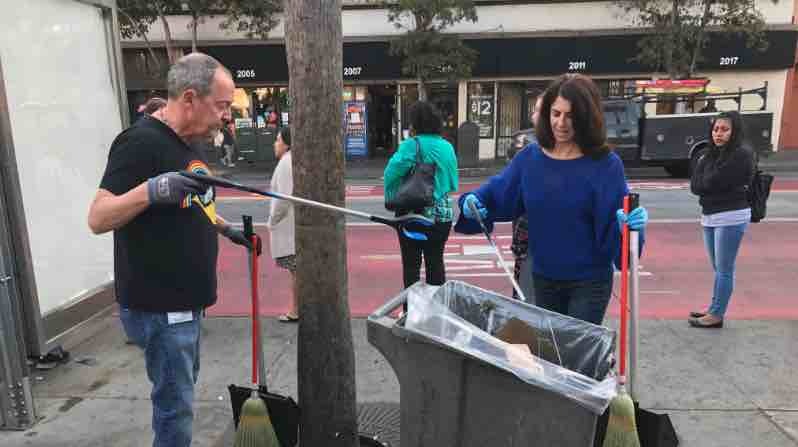 When Ronen encouraged the BART board members to join them for the morning cleanups so they could see the mess themselves, no one has yet accepted. Although her actions didn’t work on the BART members, they did inspire Jane Kim of the city’s Board of Supervisors to say that she would pick up a broom during next week’s cleanup. Since Dufty and Ronen began their work in September, however, San Fransisco Chronicle says that BART has assigned a janitor to the stations for eight hours a day, five days a week. The agency has also begun power-washing the station every night. Additionally, Ronen and Dufty have inspired the public to pitch in as well.